If you’re a big soccer fan, then we’ve got some good news for you! GameLoft has just announced Real Soccer 2012, and it’s available for free from the Android Market right now! I could explain the game to you, but the video below does such a better job at that. Although the press release dubs the game as Real Soccer, it’s listed in the Android Market as Real Football 2012. In any case, you can use the box below to download the app on your Android device (running 2.1 and up), and get to playing! So has anyone installed the game yet? Are you still holding out for Christiano Ronaldo’s Freestyle game that we haven’t heard about in awhile? Let us know in the comments! The full press release can also be found below. 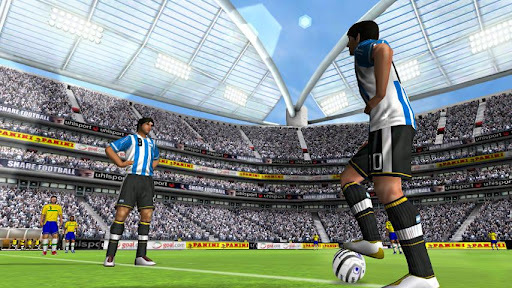 February 9, 2012 –Gameloft, a global publisher of social and digital games, today announced the launch and availability of the latest addition to the popular Real Soccer franchise, Real Soccer 2012, on Android Market. Free to download, the latest title offers improved graphics, new animations, and a completely new experience for soccer enthusiasts on their mobile devices. In addition to a series of new community-oriented features, now fans of the Real Soccer franchise can enjoy smoother and more realistic graphics for both players and stadiums alike. With over 700 motion-capture-based animations that adjust to players’ skills and positions on the field, and smarter moves for your teammates and opponents on the field thanks to an improved AI, now everyone can take part in the ultimate TV-like soccer experience. · REPLAY THE GAME YOU JUST WATCHED ON TV Ever wish you could control the outcome of a game you watched on TV? Now you can, thanks to Hypergame technology! With just a press of a button, you can recreate any matchup from the in-game news feed and play! · STAND OUT ON THE FIELD WITH CUSTOM KITS Create your own custom team jerseys, shorts and more using a detailed editor. Then share it with the rest of community, or look for cool designs made by other players and use them yourself. · THE BIGGEST, MOST ENJOYABLE SOCCER COMMUNITY Get the latest soccer news thanks to official RSS feeds from goal.com, as.com and sports.fr. Send your comments, interact with friends, or upload pictures and videos. · THE OFFICIAL FIFPRO LICENSE Enjoy thousands of real players’ names, 350 teams and 14 league championships to play including England, Spain, France, Germany and South America. Online updates of the database will keep your game up to date with the most recent player transfers and lineup changes. · MANY GAME MODES TO ENJOY Access many different game modes including Exhibition, League and various International Cup modes, or practice your skills in Training mode. You can also take over your favorite team as a manager and lead it to glory, or replay the best games of the past by entering History mode. For more information please visit our website at www.Gameloft.com.